Fines for motorists who use their mobiles while driving are set to double. The new Road Safety Act, which comes into effect will include stricter measures to curb the illegal use of mobile phones while driving. mPhone has the perfect solution to help you drive safely and communicate with all of your friends and relatives, without having to worry about breaking the law. We can offer you the latest in Hands Free Car Kit technology available on the market, as well as arrange for it to be fully installed in to your car. 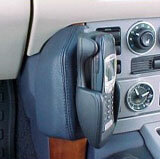 The installation work for the Hands Free kit can be carried out at your home, office or wherever is convenient. It takes around 2 working days to arrange, but there is a £60 cancellation fee, if you cancel the installation with less than 2 working days notice. Audio Loom (where applicable). This allows you to listen to the phone through the car stereo's speakers rather than the standard speakers provided with the Handsfree car kit. This is not recommended for Amplified Systems like Bose. Amplified Systems: Audio Leads cannot be fitted to vehicles with amplified stereo systems. This is because the audio will not operate via all of the speakers so it can cause an echo, interference and poor feedback. 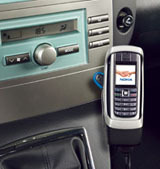 In these instances the external loudspeaker supplied with the hands-free car kit will be fitted. If you are unsure as to whether your system is amplified, please refer to the owners' handbook. We will be able to supply the special Audio Lead but this particular product is not refundable. The above installation will involve drilling into the dashboard to fit in the in-car holder. No holes will be visable once the device is put in to place or if the device is removed. Please note that these are tailor-made specific to each car make / model and therefore once ordered, there will be a further charge. There are two types of brackets; The 'Leather Mount' type shown in the picture above (extra charge of £69.95 incl VAT) and the ordinary type. This bracket is the 'No holes bracket' which is a small unit that remains hidden behind the phone's cradle, as shown on the right. The standard Manufacturer's car kit does not include a Glass Mount - external Antenna. This will be added for all installations at no extra cost. We can also arrange the de-installation of an existing car kit, the usual price for this service is £65.95 including VAT. If the de-installation is done at the same time as a new installation, in a single visit, then a £20 discount is available on the de-installation. Please note once you have booked in an installation (confirmed date and time for the appointment), there will be a £60 cancellation fee if you cancel the job without giving advance notice of a minimum of 2 working days. A similar fee will be charged if a professional fitter is scheduled to attend a site and there is an absence of attendance. We strongly recommend that the Car Kit and the installation are purchased and arranged at the same time. This will enable the fitter to install all the necessary components, thus making sure that everything is in good working order. Should there be any warranty claims in the first 12 months, the same fitter (or colleague) will attend to fix / resolve the problem for free, for a warranty claim. If the parts are supplied separately, there may be further additional charges applied by the fitter if the failure is due to a faulty part (which is most often the case) rather than a failure due to the installation work. Otherwise, each visit may incur an additional call-out charge.